August 17, 2016 in Conventions, Star Wars Wed.
Kansas City Comic Con last weekend, and now MidAmeriCon II / 74th Worldcon starts today. Same venue, but two very different events. I'm excited to see how Worldcon compares, though some differences are already apparent. With three conventions in three weeks (and two world class), it's definitely been the busiest con season I've had for a while. It definitely helps having two of them in town, and even better that both had good Star Wars connections. August 05, 2015 in Conventions, Star Wars Wed. I briefly thought about just making last week's post "GENCON!" and moving on...but I didn't even get a moment for that. It's been a busy and fun few weeks...and it's not over yet. July 22, 2015 in Star Wars Wed. It may or may not have hit stores just yet - these releases tend to be a bit nebulous - but it exists, and here's my copy that arrived Tuesday. The Star Wars Force and Destiny RPG Core Rulebook is (almost) now available (probably). I had a great time on this. It it the third of the 3 core rulebooks, and I'm happy to have been involved in all three, and many other FFG Star Wars products over the past several years. 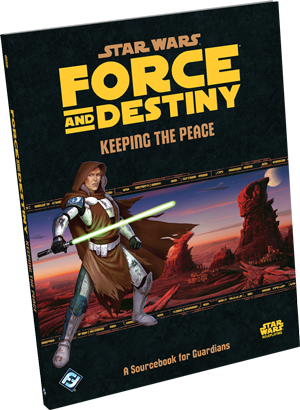 July 15, 2015 in Conventions, Star Wars Wed.
July 08, 2015 in Star Wars Wed.
Today, Fantasy Flight Games announced Keeping the Peace, a Guardian sourcebook for Star Wars Force and Destiny RPG. I'm one of the writers. June 03, 2015 in Star Wars Wed. This is one of those days when the Star Wars world, or fandom I suppose, is all stirred up from an unexpected revelation in one of the ongoing storylines. No spoilers here, but it will be interesting for a while... Anyway, there seems to be a variety of comics related news this week. Announced today, I'll be attending the new Kansas City Comic Con as a gaming guest on Friday and Saturday. KCCC is August 7-9, 2015 at Bartle Hall, downtown Kansas City. Schedules for gaming, panels, and other events will be announced before the show. Keep an eye on the web site for updates. KCCC previously announced TSR and gaming legend Jim Ward as their first gaming guest. Jim is known for the original D&D Deities and Demigods, Gamma World RPG, Metamorphosis Alpha RPG, a long list of video games, and running TSR for a time. Star Wars Marvel comics writer Jason Aaron was announced as the show's first creator guest. Jason writes the best selling main Star Wars comic line. The show continues to announce media, creator, and other guests.